Queen bed in the master bedroom with a 47" TV with DVD player, 2 double beds in the second bedroom with a 35" TV with a DVD player. The living has a 47" TV. One of the most beautiful homes in Seacrest Beach. This three bedroom two and half bath home sleeps up to 12 and has a private pool. Come and enjoy! Aqua 1903 is on the 19th floor of this beautiful resort, this place has plenty of room to sleep 8 and beautiful views of the gulf day and night. Here's the bed setup: King in Master, Queen in 2nd BR, 2 Twin in 3rd BR and a Queen sleeper sofa. If you want a beach rental with plenty of space for your entire family, Ariel Dunes 1-2101 is just the place to enjoy a truly memorable beach vacation. Schedule today!! Welcome to Ariel Dunes 1-1203. 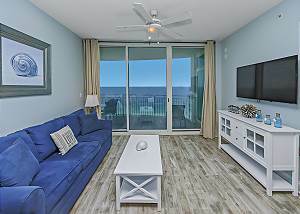 If you are looking for a Destin vacation rental that offers you incredible views of the world's most beautiful beach, our 2 bedroom, 2 bath vacation rental condo that sleeps up to 6 is just the spot for you. 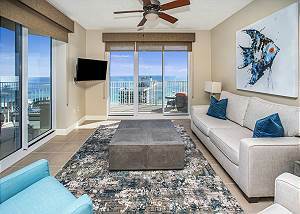 Located on the 6th floor of stunning Ariel Dunes II Condominium, this unit offers spectacular panoramic views of the Gulf of Mexico and miles of coastline. Part of Seascape Resort where the are three large pools, a fitness center. Copyright Best Beach Getaways. All Rights Reserved.